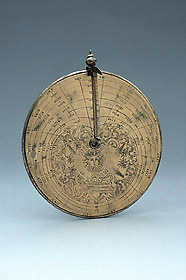 The instrument consists of a plate with a raised edge, similar to an astrolabe mater, into which fit two other plates, prevented from turning by lugs on the plates which fit into a notch in the edge of the mater. The internal side of the mater is blank. The external side has a calendar scale, with (starting from the outside): days of the months; names of the months; a division of the circle graduated 5 to 30 twice; the symbols of the zodiacal signs alternating with a decorative motif; and the names of the seasons. Proceeding towards the centre is a scale numbered from 8 to 16 showing the length of the night, and a scale numbered from 4 to 8 to 4 indicating the time of sunrise in Italian hours. One side of one of the plates is blank. The other side is engraved with common hour lines numbered from 4 to 12 to 8. At the centre is a coat-of-arms in which the charges on the escutcheon have been effaced. From the centre depart lines corresponding to different latitudes engraved on the border of the plate. The other plate has on one side planetary hours numbered from 1 to 6 to 12, with a table showing the ruling planets for each day. The other side has Italian hour lines in the form of quasi-concentric lines, numbered from 8 to 16 to 24 and in the centre of the hour lines a sun effigy. This is enclosed in a circle with the symbols of the zodiacal signs, blowing faces, stars and clouds and a half moon, and below, the inscription 'Curriculum meum perficiam donec aduenerit dominus' ('my run will be complete when the Lord will have come'). The folding gnomon is at the top of the instrument, next to the hanging ring, and is connected with the centre by a rule graduated from 5 to 641/2. The rule reads the height of the sun at the time of observation. The engraving on the instrument, partly in intaglio, partly in relief, is unusual.